Whether caused by injury, surgery, or burn, scars can be disfiguring. Scars stand out against the rest of the skin because scar tissue is made of collagen cells rather than ordinary skin cells.The way a scar develops depends as much on how your body heals as it does on the original injury or on the surgeon's skills. Many variables can affect the severity of scarring, including the size and depth of the wound, the blood supply to the area, the thickness and color of your skin, and the direction of the scar. How much the appearance of a scar bothers you is, of course, a personal matter. The problem can be improved through surgical procedures known as scar revisions or removal. Collagen Injections are used to raise, or fill in, sunken scars. Collagen is a natural animal protein, usually produced from purified cow skin. Before using collagen, you should take an allergy test to ensure that you are not allergic to the substance. 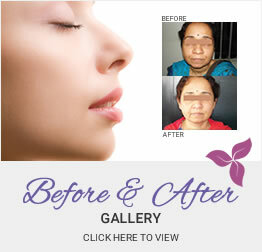 The results of collagen injections are immediate but not permanent. The scars will eventually have to be re-filled as the body slowly absorbs the collagen. Dermabrasion smoothes out surface irregularities such as deep lines or scars by removing the topmost layers of the skin. The afflicted area will be sprayed with a numbing chemical spray and then carefully "sanded" with a rotating wire brush or a diamond wheel until the desired amount of skin is removed. Vascular laser works by shrinking the blood vessels that feed the scar. This treatment is done without anesthetic. During the process, the sensation is much like that of a rubber band snapping on the skin. There are two types of lasers used for reducing the uneven surface of scars: the CO2 Laser and the Erbium:Yag Laser. The CO2 laser is typically used for deeper scars, while the Erbium is used for superficial scars and deeper skin tones. Both lasers remove the topmost layers of skin, allowing new, smooth skin to form. There are some color lasers that can be effectively treat the abnormal red pigmentation of hypertrophic and keloid scars as well. Deeper scars can be filled in with skin grafted from other places on the body. A tiny instrument is used to punch a hole in the skin, removing the scar. Then a piece of normal skin, usually taken from the back of the earlobe, is put in the scar’s place. The “plugs” are taped in place until they heal. The grafts do form scars of their own but they are less visible then the pitted scars they replace. This procedure is often done in conjunction with dermabrasion or laser skin resurfacing. Silicone gel sheets can help flatten hypertrophic and keloid scars. These clear sheets are placed on the scar and wrapped firmly with tape. In this procedure, doctors take skin from a healthy part of the body and transplant it to the injured area. Grafts aren’t always cosmetically pleasing because the grafted skin may not match the surrounding skin’s color or texture. The area where the graft came from will also scar -- but skin grafts can greatly restore function to a severely scarred area. In this procedure, a small balloon is inserted under a patch of healthy skin near a scar. The balloon is filled with a saline solution to stretch the skinWhen the skin has been adequately stretched, which can take several weeks or months, the balloon is removed. The scar is then surgically removed, and the balloon-stretched skin is pulled over the previously scarred area and carefully closed. Z-Plasty is a technique used on hypertrophic and keloid scars that do not respond to steroid treatments. The scar is surgically removed by cutting the skin around the scar in small triangular flaps. These flaps usually follow a Z-shape (hence the name), but the technique your doctor chooses will depend on the shape of the scar. The flaps are repositioned to follow natural lines and creases of the skin. The new scar is thinner and less noticeable. Z-plasty can also help relieve the pressure of contracture scars. Healing in this surgery depends completely on how you follow your surgeon's words. Although you may be up and about very quickly, it is advised that you gradually resume your normal activities. The degree of improvement depends on the size and direction of your scar and also the nature and quality of your skin, and how well you care for the wound after the operation.